We, the International League of Peoples’ Struggle, support the Hong Kong people in upholding and exercising their democratic rights. We condemn the police brutality applied by the Hong Kong authorities to suppress the people’s right to assemble and speak freely. We are aware that both the Beijing and Hong Kong authorities are anxious to end the mass protests for fear that these are likely to embolden similar mass protests in mainland China, especially because of the Tienanmen massacre in 1989 and the current deteriorating economic and social conditions. We recognize that the Hong Kong Special Administrative Region (HK SAR) is a territory of the unitary state of the People’s Republic of China. Since the British state gave up its colonial authority over Hong Kong in 1997, the Chinese government has applied a policy of “one country, two systems” relative to HK SAR and allowed this part of China a high degree of autonomy. 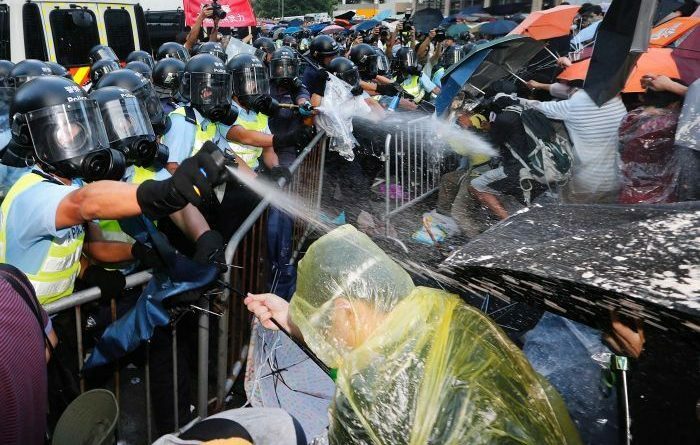 The Chinese government, the Hong Kong authorities and the Hong Kong people must peacefully and amicably settle what reforms are to be made and at what pace for their common benefit. It is in accordance with China’s national sovereignty and in the interest of the Chinese people, to harmonize the interests of the Chinese nation and the central government, the Hong Kong SAR and the Hong Kong people. We believe that it is an internal matter for China that the aforesaid interests are harmonized in a just, peaceful and democratic process. Among the protesting people in Hong Kong are patriotic and progressive forces. But there are also some agents of the US and UK and the pro-US and pro-UK section of the Chinese big bourgeoisie. We condemn the long-running and current scheme of the US and UK governments to undermine and subvert the national sovereignty of China and to cause turmoil in HK SAR for the purpose of serving the interests of the US and UK and their Chinese agents, including the section of the Chinese big bourgeoisie that is closest to US and UK imperialist interests, the Chinese assets of US and UK intelligence services and the Chinese NGO operatives funded by the US National Endowment for Democracy and the National Democratic Institute. Having become a capitalist country, China has engaged in what has been euphemistically called “economic liberalization” (meaning to say, capitalist reforms and opening up to the world capitalist system). It has generated within China a powerful fifth column, consisting of sections of the Chinese big bourgeoisie and intelligentsia who are closest to US imperialist interests, who have long demanded “political liberalization” in consonance with “economic liberalization” and who have ridiculed the use of the communist flag and occasional invocation of socialism to justify what has been called by the bourgeois press as “capitalist authoritarianism” . In the ongoing US strategic pivot to East Asia, the US is employing the full spectrum of its power to contain and press China to undertake political liberalization (reforms towards bourgeois democracy and casting away the communist pretense) and further economic liberalization (further reduction of state intervention in the market and further privatization of its state-owned enterprises). The full spectrum of US power being applied includes the increase of US military bases and shows of force around China, economic and trade demands at the expense of China, bilateral and multilateral US diplomacy, pro-US indoctrination of the Chinese intelligentsia, US funding for Chinese NGOs and incitement of mass protests against the Chinese rulers. The US seeks to restrain and discourage China from teaming up with Russia as the leading members of the BRICS Bloc and the Shanghai Cooperation Organization and from undertaking projects like the BRICS Bank, the use of currencies other than the US dollar in energy transactions and the Sino-Russian cross border trade in energy and manufactures. The US is desperately trying to maintain the delusion of being the sole superpower and reverse the reality of a multipolar world and the intensifying struggle of the capitalist powers to redivide the world as a result of the protracted worsening crisis of global capitalism, the decline of the US and the economic rise of China and Russia. In considering the growing contradictions between the US and China or Russia or both, we have seen US imperialism as the unjust and anti-people side for engaging in the most wanton plunder of human and natural resources under neoliberalism, unleashing of the most brutal wars of aggression and undertaking all kinds of intervention to violate the national sovereignty and democratic rights of peoples throughout the world. We are concerned that the US is stirring up trouble in the name of promoting democracy at the expense of Chinese national sovereignty just as the US has stirred up trouble in the name of democracy in Ukraine in order to vilify and impose sanctions on Russia. The US cannot pose as “human rights champion”, especially at this time when the people of the world are outraged by the brutality of its own homeland police-state forces. We caution China against encroaching on the territorial seas, exclusive economic zones and extended continental shelves of Southeast Asian countries under the UN Convention on the Law of the Sea. At the same time, we consider that China has the right over the Daoyu islands against the baseless claims of Japan. In any case, we condemn all the attempts of the US to use the maritime disputes in East Asia to justify its military presence in the region and impose its hegemony over the countries and peoples of East Asia. The most rabid US puppets in letting the US further entrench itself militarily in East Asia for the purpose of containing China are the Philippine and Japanese governments in Southeast Asia and Northeast Asia, respectively. In this statement, we have put the current mass protests in HK SAR in a context wide enough to show the complexity of factors and conditions that we should take into account. When large masses of people rise up to protest and make demands, there are serious matters to discuss and settle by those most concerned. We hope that in due course the current Hong Kong crisis can be settled in a just and reasonable way for the common good of all those concerned and that the imperialist interlopers and their agents are prevented from having their way.